This book review was first posted on The Guardian Children's Books Website, click here to see it. "Freida and Isabel have been best friends their whole lives. Now, aged sixteen and in their final year at the School, they expect to be selected as companions - wives to wealthy and powerful men. The alternative - life as a concubine - is too horrible to contemplate. But as the intensity of the final year takes hold, the pressure to be perfect mounts. isabel starts to self-destruct, putting her beauty - her only asset - in peril. And then into this sealed female environment, the boys arrive, eager to choose a bride. 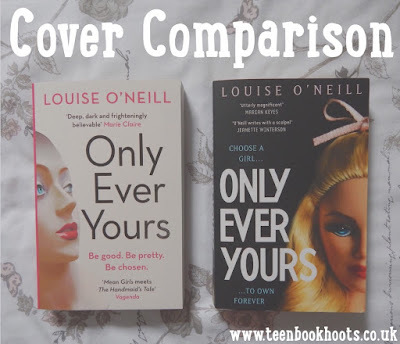 Freida must fight for her future - even if it means betraying the only friend, the only love, she has ever known..."
I can't even express how much I adored reading, 'Only Ever Yours.' It captivated me from the first page- my eyes and mouth wide open in shock after reading each chapter. Freida and Isabel have been the best of friends for the whole of their lives, and were absolutely inseparable. They are, 'eves'- who are perfectly designed to satisfy a man, once reaching the age of seventeen. They can become a 'companion,' to a young inheritant, (bearing all of their sons), or they can become a 'chastity.' But- the eves could become a concubine, which is a horrible lifestyle for some. Each eve has standards to reach: their faces must be perfect and radiant, and they must also hit a certain target weight: to appeal to the inheritants. After countless years of preparation; Freida and Isabel's final year falls- and the pressure to be perfect is mounting up and becoming too much. Who has all of the secrets? Who will crack? 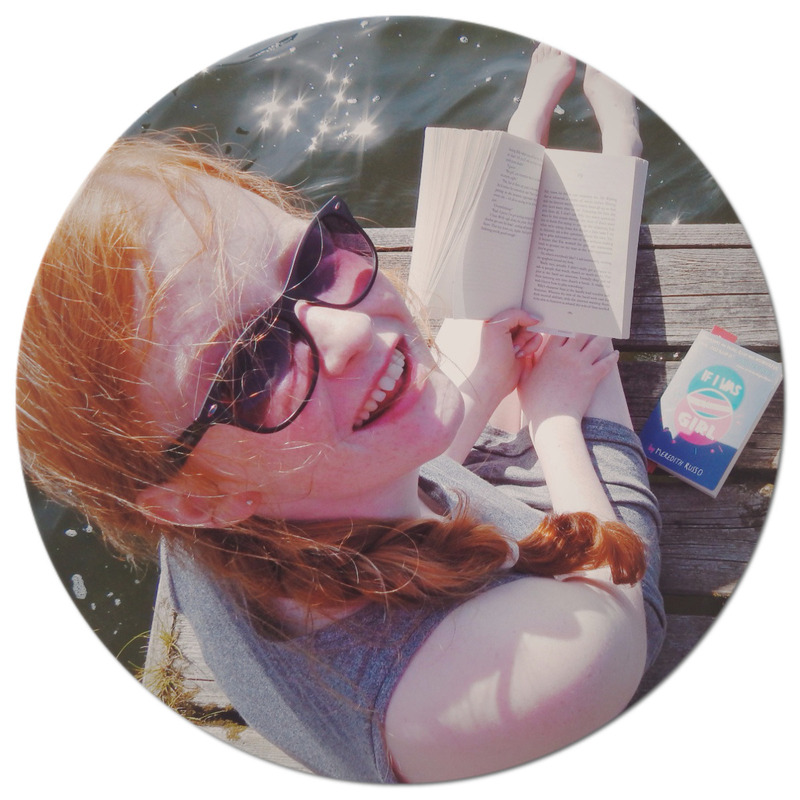 O'Neill can grab and hypnotise her readers- making them fall into a trance, until they finish the last word. I couldn't even guess or expect what would happen, as the writing and the plot together take you on a roller coaster ride; with twists and turns that make your stomach shudder. 'Only Ever Yours,' hits a soft spot for many- as it is a realistic interpretation of what could happen to the world, in the not so distant future. Overall, I rate this book 5/5, as it had me hooked the whole way through, with a remarkable and quirky plot- and riveting characters. Honestly: I would advise you to buy it right now, as it is one I am going to treasure on my bookshelf, for sure. It really takes YA in a fresh, gritty and dark direction. In my opinion, I think that both of the covers could appeal to totally different target audiences. 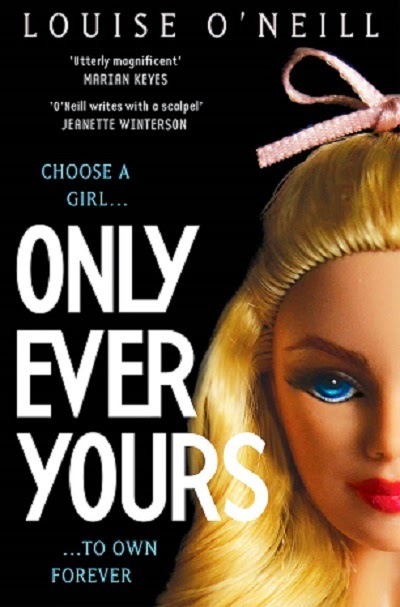 The second cover is the original one, (that is targeted at young adults), as the image of the flawless barbie doll would definitely attract them to read the book. Personally, it definitely did draw me in to read the synopsis- therefore making me desperately want to buy it, and to hurry home and read it. The black background with the strong white writing instantly emits the tone and feel of the book, which is something that young adults like to have right in front of them. The new cover is quite different- the white background with the black writing gives the book a more neutral, clean feel. It gives adults more to think about as they look at it: as there are various different plots that people could think the book will take, simply just by looking at the cover. Having read the book, I do think the cover image suits the novel more than the first- as it reminds me of a more realistic picture of the background of the book: if I was to conjure one up in my head. I do prefer the new adult cover: as it is much more easy on the eye and stands out amongst other books: it also gives the reader an element of mystery to let their mind wander about what will happen in the novel. I loved this book so much! I can't wait for "Asking for it" It's already getting great reviews! I've heard a lot about this author and her book 'Asking for It' so I will need to check this out before I buy that book to familiarise with the author! I actually like the YA cover more, it seems to have the "perfect image" down moreso than the adult. Also, I loved the book, but the ending... I got so annoyed with frieda. She seemed really entitled. This book is amazing! Definitely my favourite read of last year!